On Thursday I met Marianne Faithfull for the first time at rehearsal, and then played two shows with her this weekend. It was intense. It was musically challenging. It was amazing. She’s written countless great songs, including the Stones’ “Sister Morphine.” Her songwriting collaborators have included Nick Cave, Polly Harvey, Jon Brion, Angelo Badalimenti, Beck, Roger Waters, Dave Stewart, Damon Albarn, Jarvis Cocker, and many others. Many great songs were written about her: The Stones’ “Let’s Spend the Night Together” and “You Can’t Always Get What You Want.” The Beatles’ “And Your Bird Can Sing.” “Carrie Anne” by the Hollies. Many great songs were written for her, including “As Tears Go By,” which she recorded before the Stones, and “Strange Weather” written for her by Tom Waits. She portrayed God on the TV series Absolutely Fabulous. She portrayed the devil in the stage production of Tom Waits’ The Black Rider. In the early ’70s she was a junkie who lived homeless on the streets of London’s Soho district for two years. She appears as one of the hangers-on in the seminal Bob Dylan documentary, D.A. Pennebaker’s Don’t Look Back. She’s written two riveting memories: 1990’s Faithfull: A Biography (with David Dalton) and 2008’s Memories, Dreams, and Reflections. She has collaborated with an astonishing list of great guitarists. Jimmy Page played on her earliest sessions. The week before last, she performed in Vienna, Paris and London with Bill Frisell, who’s worked with her for almost 30 years. Her other guitarists have included Keith and Ronnie from the Stones, Marc Ribot, Ry Cooder, Barry Reynolds, Chris Spedding, and Polly Harvey. So no pressure there. Marianne is one of my musical heroes — and would be even if she’d done nothing more than record 1979’s Broken English, for my money one of the bravest albums of all time. She is cool, gracious, witty, generous, and generally brilliant. What an experience! All this unfolded against the delirious backdrop of San Francisco Pride Week, with the entire city exulting in the US Supreme Court ruling that nullified California’s homophobic Proposition 8. I strive to keep this blog apolitical, but I must speak out here, since the issue of marriage equality affects my family, friends, co-workers, bandmates, teachers, and mentors. 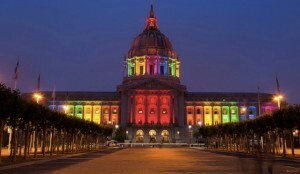 My eyes teared up when I saw the pics of anti-Prop 8 plaintiffs Sandy Steir and Kris Perry getting hitched in the beautiful SF City Hall rotunda, where my wife and I exchanged vows 20 years ago. 17 comments to Well, THAT Was Quite a Week! Wow Joe, you get to play with some cool people! I still have my copy of Broken English on vinyl and on my iPod. please play in Paris ! I saw Marianne in duo with Bill Frisell a couple months ago, they were amazing. Why’d you do it, Joe? Well, I guess I would have too. very awesome…I love Bill Frisell too…he’s dynomite! Great article Joe! I have been a big Marianne Faithful fan since “Tears Go By” first played on my 6 transistor portable radio (and the were all germanium transistors) back in the 60’s. Broken English is a big fave of mine and I agree with you here Joe that it is a real gem of a CD. The songs are truly emotionally authentic and are filled with grit of real life experience. There are only a few CDs/Albums in my collection that reach me like Broken English does and that is a real tribute IMHO. I’ve always felt she never got the acclaim she deserves but it is probably because her music is so honest and emotionally demanding. Thanks Joe, for shining a little light on a musical treasure. I just noticed that the title of one of her memoirs (Memories, Dreams and Reflections) was also the title of Carl Jung’s memoirs – she is a clever boots, no?